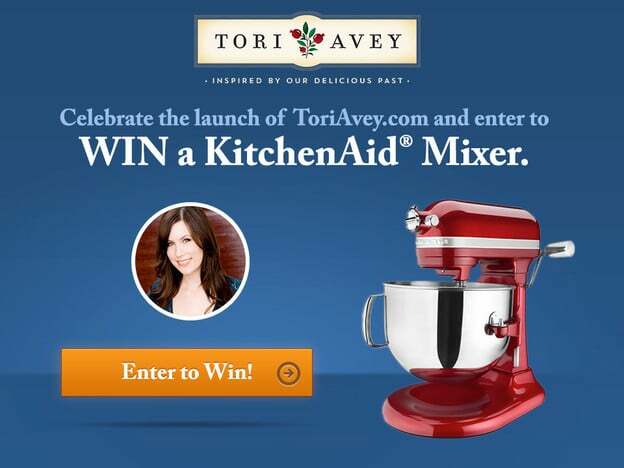 You are here: Home / Tori's Corner / Contests and Giveaways / Win a KitchenAid Mixer! Well friends, it’s official… I’ve launched a new website! Those of you who visit my sites frequently will notice that my blogs recently had a pretty major “makeover.” I’ve combined my two blogs, The Shiksa in the Kitchen and The History Kitchen, into one simple easy-to-navigate website, ToriAvey.com. I’m super excited with how it all turned out… and I’m giving away a free KitchenAid mixer to celebrate!! It’s my way of saying “thank you” for all of your support since launching the blog a few years ago. You’ve helped to grow my site into one of the most dynamic, interesting, delicious cooking communities on the web! To enter the giveaway, simply comment below with a valid email address and let me know how you would use this KitchenAid mixer. Entering will also sign you up for my free newsletter including tasty recipes, cooking and household tips, and more! If you’re already receiving my newsletter, don’t worry, you’re still eligible. Go ahead and comment I know you’re interested in this particular giveaway… you won’t receive multiple copies of the newsletter. Winner will be chosen from the comments using a numeric randomizer. So tell me… what will you mix up in your brand new, beautiful KitchenAid if you win?? CONTEST CLOSED. Our winner is Matthew Hudack! Matthew’s comment was chosen by a numeric randomizer (totally random, folks!). To those who didn’t win, don’t worry. I’ll be doing many more giveaways on the new site, stay tuned! I’d love to try making challah. Oh it would be a massive cookie extravaganza!! Initially it would look fabulous sitting on my kitchen counter! Then it used to make smooth, creamy cheesecakes and loaf upon loaf of light, fluffy, fragrant bread. Love this site. Have enjoyed the delicious recipes that I’ve tried so far. Clear instruction and photos have been very helpful. The pretzel challah recipe that brought me here. And any other recipe I can find to feed my incredibly picky 2 year old! Bread is my first choice, then cakes and cookies. Would love to have a new KitchenAide. Have a really old one – the slowest speeds don’t even work anymore; so a new one would be great! Thanks for the give-away. And for the yummy recipes. Really appreciate the History Kitchen, as i thoroughly enjoy reading about where these old recipes originated. I would make divinity, amish potato bread,lemon meringue pie,rum cake,windmill cookies, and lemon sugar cookies. Congratulations on your website. if i had a kitchen aid i’d put up some cinnamon buns or babka!!!! I love love love your blog! I have been using it for over a year now, it seems. Everyday on my work break I look up recipes and see what you have to offer. Pick me!!! If I win, I will practice baking Challah! Family Austrian pastries handed down from my mother and grandmother. My mixer just broke. I would love to win this beautiful mixer so I can donate to a local charity that provides help for homeless families. Bread for sure. I am attempting to feed my family less processed food. I love to bake bread and would love to never buy store bought bread again. Love the tradition of kneading by hand but to bake “in bulk” a mixer would be handy. Here in India a Kitchen aid mixer is used in bakery for professional use. Hence I always wanted one. It will facilitate my job in the kitchen. It will be a great help in making Cakes, cookies, breads and what not? I really need one. Thanks Tori. baking sweets with my little ones! My baby’s first birthday cake! <33 Fingers crossed. I would love to make bread but without a mixer, I can not knead the dough. I would use it to make lots and lots of cakes and flavored whipped creams. I just had my bridal shower and was gifted many old recipes from all of my friends and family, including blueberry lemon cake, mandelbrot, and many other wonderful recipes from generations past. Would love to use the mixer to try them all out. I would make a meringue~! I bake challah by hand weekly and would love to own this mixer. I would make a double recipe of one of my biscotti cookies or a cake for the next family member’s or friend’s birthday. I love love love baking!! My late husband gave me a beautiful Kitchenaid mixer. A few years after he died, Imoved to FL, and my beloved mixer broke in the move, beyond repair. I really miss it, but the pension I live on doesn’t allow for buying such expensive equipment any more. If I win, I will use it to make all kinds of baked goods! I regularly cook contributions for parish meal events, which we have every week and sometimes more often. brownie and chocolate cakes and many other treats 🙂 Thank you for this grand give away. So many things. Ermine frosting would probably be first! I’d mix everything. I have an old hand mixer I use. It’s avocado color. Or I mix by hand. Breads, carrot cake, what ever. Tori, Your website is awesome! Best rugelach…everyone loves it! If I am a winner I plan to bake, bake bake! Homemade pasta, pizza dough , sausages! I’m the baker in our house, so I’d use it for cakes, and for kneading bread dough. I will start making homemade bread in it for my family! So we can start eating healthier! Thank you and have a GREAT Memorial Day to you and your family! Cheesecake for Shavuos. Only a Kitchen Aid can handle all that cream cheese! Breads, cookies, cakes and more! I’d make a pound cake first, then the sky would be the limit!! Ii would use the mixer to.learn to cook and make my own bread. Love the hummingbird cake recipe….thanks! Love your many fabulous recipes , you make it very easy to follow. Would love to have a blue Kitchenaid mixer. Breads to welcome new neighbors, cakes for my friends and loved ones, and especially cream cheese and butter frosting (I make this a lot!). Hi Tori…Thanks for your last update about that contest app. I had several problems with it. I tried another of your recipes out….spinach dip. It got RAVE reviews. Virtually everything I have tried on your site has been a HUGE hit! Grandma Flossie Rolls…the wonderful dinner roll recipe from my husband’s dear grandma Florence May. I love to bake and try new recipes all the time and have even started trying a couple of yours! I recently got a few chickens so I’ve been planning on baking a lot more with all the eggs I’m going to have. Plus I’ve been wanting to make my own dog treats and a kitchenaid would be a great help with the dough for the biscuits. My friend has one and it’s amazing how much she can do with it, I’d use it everyday for all sorts of goodies and meals! I would try new recipes! I would use the mixer for all my favorite recipes that require mixed ingredients. I would love a Kitchen Aide mixer and use it as palette for my creations. I make a wild zucchini cake without flour and this might be better than the hand mixer. Enjoyment for me is to make food for others and just surprise them, so this would be a tremendous win. Whomever wins will enjoy it and it would be great if they post their creation. OMG,, I’ve wanted one of these for so long. Here’s hoping. I would make chocolate chip cookies. Yum! We have a family of 7 and they all love to cook. One has a favorite vegan blitz casserole she says would be a snap with a new mixer and another claims she needs it for all of her cookies. The boys want to try new bean burger recipes, while I think some nice whole grain bread would work nicely. The husband chimed in with a vote for creamy garlic potatoes! So in this home it would definitely get a workout! I want to try my hand at gluten free bread. A loaf of cinnamon bread! Challah and any thing I can. I just moved in to my new house and don’t have a mixer right now and am mixing everything by hand.So this would be awesome! To make my Mother’s sponge cake… sigh …. I really like to “whip” ground beef before I make hamburger patties. This makes the meat very tender and juicy. This is only 1 of the many ways I would use this mixer! With a new KitchenAid mixer I would make pie dough for dozens of quiches (roasted red pepper & cauliflower, cheese and broccoli, smoked salmon & dill, pumpkin) to fill my aging in-laws’ freezer so there will always be something for them for dinner. Challah dough all the way, for the challah baking classes I host in my apartment!!! If I won the KitchenAid Mixer I would make my mother’s sweet apple challah to share with everyone. I have had 2 carpal tunnel surgeries in my right hand and I miss fresh bread. I am 30 miles form a market soooooo I will use it to make bread! I want to make the lemon poppy seed Bundt cake recipe you posted a couple months ago! I have a Chef friend that retired to the Philippines and started a program to feed undernourished children there. He recently told me that a kitchenaid would be worth it’s weight in gold to him but sadly, neither of us can afford it. Winning this would be an amazing blessing just when it’s needed. I put his website in the optional URL line. I live in a remote village in Alaska with no road access or grocery store. We moved here last summer and since then I have learned how to make lots of things I never thought I would even try. We make all of our bread, yogurt (from powdered milk), crackers, tortillas, and many other things I NEVER dreamed I would make at home. I would use this everyday to continue to fill our kitchen with delicious food!